Track included in Atto II album by Love Orchestra, 2004. Performance by Gian Luca Luke Mazza, 2011. Music performance by The Cream Puff, 1997. More 4.000 official singles for this tracks by Luke and The Cream Puff. From Additional love album by Luke and The Cream Puff, 1992. Television new age single by Love Orchestra, 2008. Italian hiy radio single by Gian Luca Luke Mazza, 1997. Track included in Romanzo D'amore album, 2011. A romantic love song by Gian Luca Luke Mazza, 2011. Track included in The Cream Puff tribute album, 2005. From Love to be love compilation. Music performance by Love Orchestra, 2008. Unplug and sensitive song by Love Orchestra, 2004. 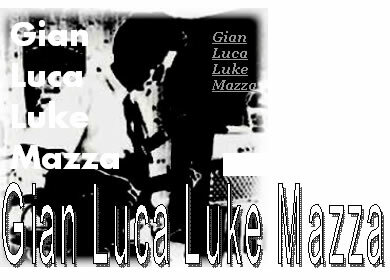 Gian Luca Luke Mazza feat. Laura De Biagi, 2011. Music performance by Tribal dance evolution project band, 2005. Gian Luca Luke Mazza in unplug track, 2011. Gian Luca Luke Mazza in European blues single, 1995. Orchestra spettacolo La Dolce Romagna, 2008. Track included in Love to be love compilation, 2008. Gian Luca Luke Mazza feat. Christopher Mazza in rock and roll jam session. Love music entertainment by Gian Luca Luke Mazza - Love Orchestra - The Cream Puff - Tribal dance evolution project band. All band and music project come from Republic of San Marino. The tracks in this web music romantic zone are originally and free. All tracks included in Gian Luca Luke Mazza official discography and Gian Luca Luke Mazza offical italian and european hit radio & television singles. : Additional love album by Luke and The Cream Puff (001 - 1992), Atto II album by Love Orchestra (GLM03/04 - 2004), The Cream Puff tribute album by Gian Luca Luke Mazza, The Cream Puff, Tribal dance evolution project band (CDRL81 - 2005), Love to be love compilation by Gian Luca Luke Mazza, Tribal dance evolution project band, Scalo, Orchestra spettacolo la dolce Romagna, Love Orchestra (TOBE08 - 2008), Romanzo d'amore by Gian Luca Luke Mazza, The Cream Puff, Love Orchestra, Tribal dance evolution project band (GLM2011 - 2011).